The year of 2016 is almost over so prior to posting a year summary we'd like to highlight some significant updates from December. NVidia GPU decoder is now supported in addition to NVENC encoder. Software decoder threads are also now available to increase performance. We've also added an article about setting constant bitrate for transcoding with x264. This all improves efficiency and overall user experience of our Live Transcoder. Nimble has interesting update for ABR. You can now add multiple language streams into ABR stream. So you can combine N video and M audio streams for further usage in any player. Icecast live metadata can now be added to any outgoing Icecast stream using WMSPanel UI. Read this article for details. This is a good addition to existing Icecast metadata pass-through. 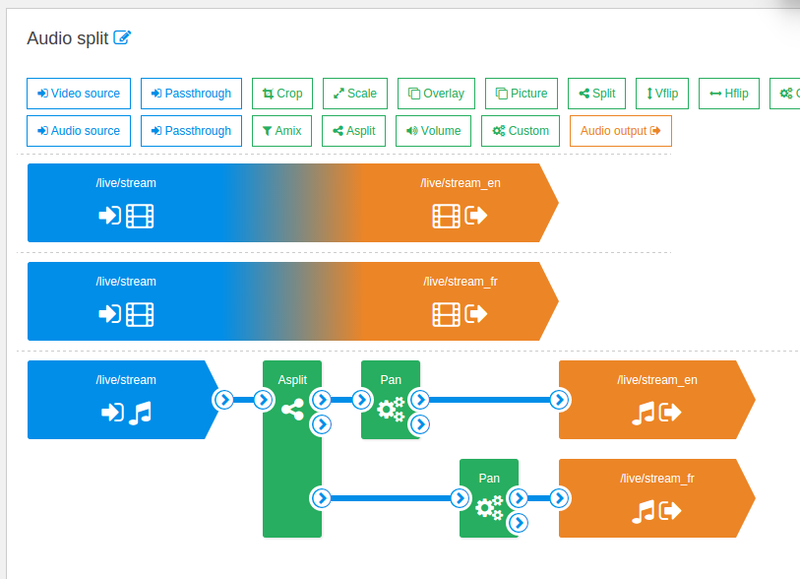 Read about more audio streaming scenarios supported by Nimble Streamer. Larix mobile SDK has been updated. Long press preview to focus lens to infinity, double tap to continuous auto focus. iOS SDK has minor fixes and improvements for streaming. Use this page to proceed with SDK license subscription. In a few days we'll also release a yearly summary of our company. Follow us at Facebook, Twitter or Google+ to get latest news and updates of our products and services. 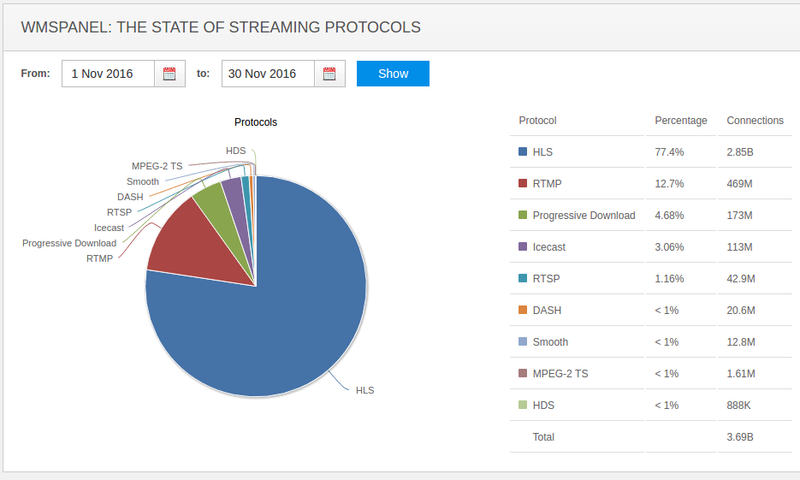 Softvelum team which operates WMSPanel reporting service continues analyzing the state of streaming protocols. As the year of 2016 is over, it's time to make some summary of what we can see from looking back through this past period. The media servers connected to WMSPanel processed more than 34 billion connections from 3200+ media servers (operated by Nimble Streamer and Wowza). As you can tell we have some decent data to analyse. Live Transcoder for Nimble Streamer has wide range of transcoding capabilities which include H.264 encoding with x264 library licensed for commercial usage by our company so any customer with our Transcoder may use x264 parameters to set up outgoing stream. This article answers a popular question of our customers - "How can I set up constant bitrate for my streams?" - using x264 encoder settings. This encoder is also known as libx264. Let us give a couple of short answers and then a full description. Nimble Streamer has an extended audio streaming feature set for both live and VOD. Live audio streaming covers both transmuxing and transcoding of Icecast pulled and published streams. In addition to just transmuxing and transcoding audio, Nimble now allows adding any metadata to any outgoing Icecast stream. So any player capable of Icecast playback and metadata processing will show respective info during the playback. Nimble Streamer Live Transcoder has full support for NVidia video transcoding hardware acceleration. Some complex transcoding scenarios may result excessive load on the hardware which may affect the performance and result errors. So you may find the following lines in Nimble Streamer logs: "Failed to encode on appropriate rate" or "Failed to decode on appropriate rate". This is a known issue for NVENC. There are two approaches to solving this problem. Nimble Streamer Live Transcoder allows performing various transformations over incoming video and audio streams. Any incoming stream needs to be decoded before any further transformation unless you use a pass-through mode. The decoding may be either hardware-based (such as NVidia GPU decoding supported by Live Transcoder or Intel QuickSync) or software-based. Software decoding may be optimized in order to use processor resources optimally. This is why the Transcoder allows using multiple threads for video decoding. By default the decoding is performed using one thread for one stream on one CPU core. If the decoding doesn't consume entire core, more threads are added into that core. This means you need to run one decoding thread on several cores - this is where multiple threads are used. Notice that before adding new threads, make sure your CPU is not 100% loaded before adjusting threads number. Nimble Streamer Live Transcoder has full support for NVidia video transcoding hardware acceleration. Having the hardware capable of the processing and drivers properly installed, our customer can choose NVENC to handle processing. NVidia® Products with the Kepler, Maxwell and Pascal generation GPUs contain a dedicated accelerator for video decoding and encoding, called NVENC, on the GPU die. You can take a look at the list of NVidia GPUs capable of that. We've previously described the NVidia encoding setup. Now lets see how hardware-based decoding can be used. In the transcoding scenario you need to point to video decoder blue rectangle (with a film on it) and then click on appeared gear button. You'll see decoder settings dialog. In the Decoder drop-down list it will show "Default" option. This is a software decoder used by Nimble Transcoder by default. 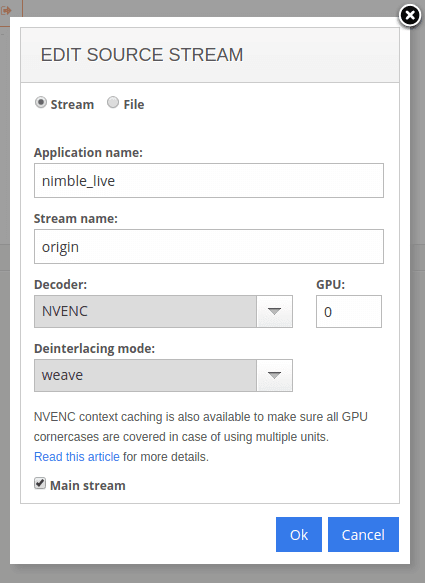 To use GPU decoder, choose NVENC from from list. This will pick up NVidia GPU to take action. The GPU field is a number which allows specifying the sequential number of physical GPU to process the decoding. So if you want to specify exact GPU to decode specific stream, you need to type the number, e.g. 0, 1 etc. for as many GPUs as you have. Many Nvidia GPU cards have encoding sessions count restricted to 2 active sessions, the decoding sessions are not limited. So you can use even GTX card to help the transcoder to decode with no limitation. Please refer to NVidia documentation for more details on each mode. If you'd like to use software decoder though - please check this article. To improve your NVENC transcoding experience, please also take a look at Transcoder troubleshooting covering most frequent questions. 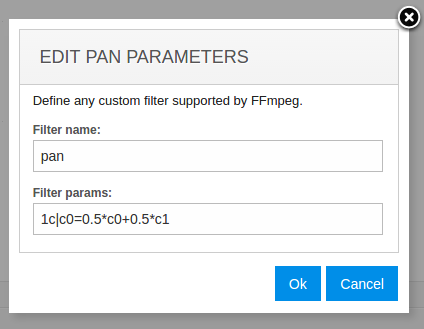 We keep improving our transcoder feature set, contact us for any questions. We've made a few significant updates in November. First, Larix mobile SDK for iOS has been updated with a new feature - Auto Focus Lock (AF-L). Just long press anywhere in the preview, and AF is locked until you tap to re-focus. Nimble Streamer has a few updates as well. Published Icecast streams can now be processed in Nimble Streamer. Read this article to see how it's set up and find out more about audio streaming scenarios supported by Nimble Streamer. If you face any artifacts when publishing streams via UDP to Nimble Streamer, read this post describing the steps to avoid them. WMSPanel non-admin users can now be granted permission by account admins to control Nimble Streamer instances. Please read this article for more details. Last but not least, if you use WMSPanel API to control Nimble instances, you may set up threshold notifications to be alerted when you make too many API requests and are close to reach the calls limit. Visit this page for details. The last but not the least update: check the State of Streaming Protocols for November 2016. The metrics calculations are based on ~3.7 billion views. The stats are collected from 3100+ media servers (Nimble Streamer and Wowza). Protocols share remain stable, i.e. HLS share is about 77% with RTMP around 12% and progressive download near 5%. You can compare that to October stats below. Nimble Streamer has wide audio streaming feature set which includes both live and VOD. Live audio streaming covers both transmuxing and transcoding of Icecast pulled streams. Now we're expanding this feature set by supporting the published Icecast sources which have MP3 or AAC codecs. Those tools' configuration files and sample playlists can be found in a separate githib repo in our account. In our case the standard "source" login is used and the password is "secret" - just for demo purposes. Let's see how it's set up for Nimble Streamer using WMSPanel. Nimble Streamer can be controlled in two ways. First one is to change config files, the second one is to use WMSPanel as a web UI. WMSPanel is the easiest way to manage your streaming infrastructure based on Nimble Streamer. You can access via any browser and apply settings to multiple servers. Usually only account admins could control Nimble Streamer behavior. Now, WMSPanel allows those admins to give permission to non-admin users for controlling Nimble Streamer instances. You can specify which servers they may control and then set up white label access to WMSPanel to change the look-and-feel on the panel in order to make it look like you need. Let's see how you can give that access. October brought some good news for our customers. First of all, we're honored to see Nimble Streamer as a finalist of Streaming Media Europe Readers Choice Awards in the "Best Streaming Innovation" nomination. We thank everyone who voted for us and hope to get more highlights by the industry press in future. Speaking of industry highlights, we are glad to see Radiant Media Player team now considers Nimble Streamer as fully supported media server. You can see us among the partners of this excellent solution. Nimble Streamer Live Transcoder now has full support for NVidia hardware encoding acceleration via NVENC for H.264. It's available for both Windows and Linux platforms. You can read this article for more details about the setup and capabilities. Our customers report on huge off-load of their CPU when using GPU via our Transcoder. Nimble has improvements for both VOD and live scenarios. When setting up origin-edge delivery configuration with RTMP delayed pull option, you may experience some delay on the viewer side starting the playback from edge. We've added a new option for origin side which you can use for decreasing the buffer. Read this article for more details. Audio-only and video-only transmuxing for ABR VOD HLS is now supported. You will use SMIL files for that purpose, read this article for more details. Larix mobile SDK was improved for both iOS and Android. iOS SDK now has Larix sample application with Swift 3 support along with improved audio quality. Android has streaming enhancements as well as sound Mute support. Latest versions of SDK packages will be sent to our customers this week. Subscribe here to get those in case you haven't done it yet. When you make setup for streams check-overs, you can now select to alert on email and push API when at least one checkpoint reports offline or when all checkpoints report offline. For your convenience the subject also now contains stream name with checkpoint names, like "Stream offline alert (1/6) - Nimble Promo Video AMS1"
The last but not the least update: check the State of Streaming Protocols for October 2016. The metrics calculations are based on 3.7+ billion views. The stats are collected from 3000+ media servers (Nimble Streamer and Wowza). Protocols share remain stable, i.e. HLS share is about 75% with RTMP around 12% and progressive download near 6%. MPEG-DASH is ahead of SmoothStreaming, both having less than 1%. RTMP-related feature set of Nimble Streamer allows creating various streaming scenarios with your infrastructure. One of them is delayed pull, or pull by request. It allows saving bandwidth when some stream is not consumed by viewers. When a viewer requests an edge server for some stream - e.g. via HLS - this edge will start pulling RTMP stream right at that moment. So the origin will give the stream only when it's needed. You can read more in this article. Usually it takes some time to start the playback on viewer side so we added an enhancement for this scenario. You can now specify RTMP buffer items count on origin so the edge could get bigger buffer to provide it to the player. So the player will get several chunks almost immediately and start playback in a second without buffering. To make this work, follow these steps. 1. Upgrade your edge and origin Nimble instances. Now, once the edge requests origin it will get 30 seconds buffer immediately and will start the playback. You may find other fine tuning techniques for live streaming in Performance tuning guide. As you know, Streaming Media is the leading magazine in the online streaming industry. We've been visiting their conferences - Streaming Media East and Streaming Media West - for several years so far and we're excited to participate in their activities. 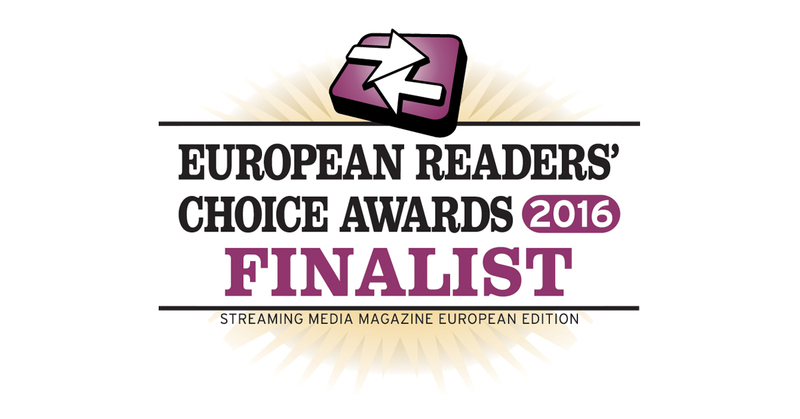 Now we're honored to have Nimble Streamer as a finalist of Streaming Media Europe Readers Choice Awards in the "Best Streaming Innovation" nomination! NVidia® Products with the Kepler, Maxwell and Pascal generation GPUs contain a dedicated accelerator for video encoding, called NVENC, on the GPU die. NVENCODE API enables software developers to configure this dedicated hardware video encoder. This dedicated accelerator encodes video at higher speeds and power efficiency than CUDA-based or CPU-based encoders at equivalent quality. NVENCODE API allows the programmer to control various settings of the encoder to set the desired tradeoff between quality and performance. Nimble Streamer Live Transcoder has full support for NVidia video encoding and decoding hardware acceleration. Having the hardware capable of the processing and drivers properly installed, our customer can choose NVENC to handle streams' encoding. You can take a look at the list of NVidia GPUs capable of hardware encoding acceleration. To make HW acceleration work, you need to install the graphic card drivers into the system. Use this link to download and install them. If you haven't yet installed Nimble Streamer transcoder, use this page to find proper setup instruction. The transcoding scenarios are created using our excellent web UI. You can check this YouTube playlist to see how various use cases are defined. Takes just couple of minutes to complete. Nimble Streamer Live Transcoder gives wide range of capabilities to transform both video and audio. Audio features allow doing various complex actions on sound as well as do some one-step actions like audio re-sampling. Let's see a sample scenario shown below. First, you see a passthrough of video just because this demo is for audio. Then you see audio stream input and audio output with AAC encoder. Nimble Streamer handles VOD streaming in various ways, one of them is doing ABR VOD via HLS and MPEG-DASH streaming protocols using SMIL files. You can use SMIL to specify separate tracks in MP4 files which will be used transmuxed specifically with only audio or video for both HLS and DASH. This allows lowering the bandwidth usage. To illustrate this approach, let's take a look at audio-only use case. We have "bigbuckbunny_450.mp4" file with audio we want to use and video track. There are bunch of other files with different video renditions, without the audio. Check the sample SMIL file below. The metrics calculations are based on 3.24 billion views. The stats are collected from 2800+ media servers (Nimble Streamer and Wowza). Protocols share remain stable, i.e. HLS share is about 71% with RTMP around 12% and progressive download near 10%. You can compare that to August stats below. Nimble Streamer DVR is a popular feature for those of our customers who handle live streaming. New use cases are being covered per requests of clients all the time. So today we add "read-only" archive parameter along with respective API methods. Switching the stream to read-only mode allows stop the recording of the stream while making it available for the playback. This is different from current "pause" functionality when the stream is both not recorded nor played. It should help when you need to make scheduled recording. E.g. some show is running and you set it up to record (disable read-only). When it's over, you set it to read-only and your viewers can watch it. Another use case is the archive attachment, like when you previously recorded some stream and moved it to some playback dedicated server. The basic DVR setup is described in this article so here we'll take a look how you can operate this via our excellent web UI. Same operations are available via API so there will be no difference whether you do it by hands or by the script. Voting is now open for the 2016 Streaming Media Readers' Choice Awards. Both products are listed under our company name Softvelum. You must enter a valid email address when you vote; you will receive a confirmation email when voting closes on September 26. You must click the link in that confirmation email for your vote to count. You can read more about nominations on this page and vote. Nimble Streamer now supports subtitles for VOD streaming via WebVTT, SRT and TTML formats. This support includes both single subtitle files and multiple files via SMIL. SMIL sample files can be found in a new githib repo. We also extended codecs coverage for Nimble Streamer. We introduced support for PCM, or G711, (both a-law and μ-law) audio codec. It can be used as input for Nimble Streamer Live Transcoder for further transformation into AAC. It also can be used for RTSP transmuxing - it will be passed through from input to output. Our mobile SDK for Android now has new application graphics and layout. It's a lot nicer now - get it on Google Play to check. Next month we'll introduce new graphics for iOS as well. For those who extensively uses WMPSanel API we added a code for sample API proxy on our github. If you need to get more information for analysis when trying to solve some Nimble-related issue, check Logging levels article. Once you need more details - just use the level you need. 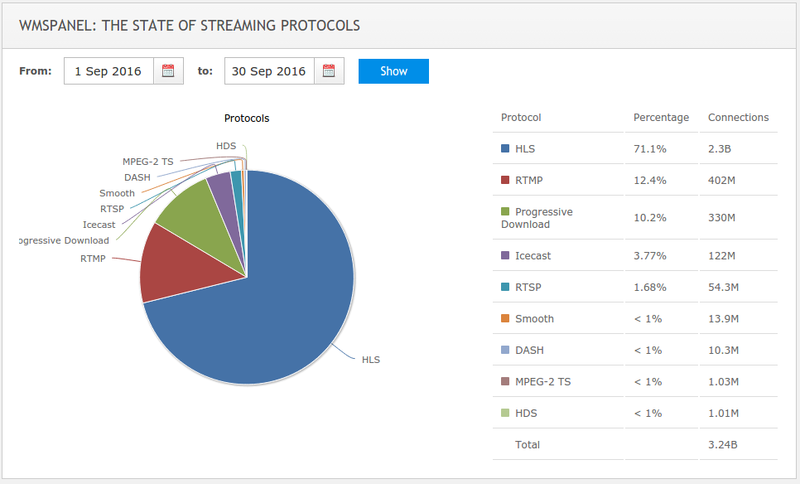 The last but not the least update: check the State of Streaming Protocols for August 2016. The metrics calculations are based on 3.17 billion views. The stats are collected from 2800+ media servers (Nimble Streamer and Wowza). Protocols share remain stable, i.e. HLS share is about 73% with progressive download near 11% and RTMP around 10%. You can compare that to July stats below. Nimble Streamer has wide VOD streaming feature set which covers many HLS-related capabilities like ABR streaming or multiple tracks support. Now Nimble Streamer is capable of adding subtitles to VOD streams. Supported formats include WebVTT, SRT and TTML. Simple scenario - a VOD file with one rendition has one corresponding language subtitles file. This is most common use case and it's handled in a simple way. Complex scenarios like multiple languages for multiple renditions or other versions of the content. It's based on SMIL files usage and it can cover various use cases. Let's take a look at both of them. As any server software, Nimble Streamer allows tracking its behavior and performance via logging. By default, Nimble Streamer server logs are available in /var/log/nimble.log for Linux and in application log folder for Windows. However you can control that in a config file. Read this article to see how you can define destination for your logs. You may also choose logging level for server information via web UI. The more detailed logging is selected, the more information you'll get as output. All settings are applied without server restart which allows easily manage its behavior depending on your needs. Recently we were extending codecs coverage for Nimble Streamer. Today we introduce support for PCM, or G711, (both a-law and μ-law) audio codec. Nimble Streamer Live Transcoder, RTSP transmuxing, Codecs support in Nimble Streamer transmuxer. July was very intense in terms of new features. Icecast/SHOUTcast transmuxing was entirely re-worked and it now allows processing audio streams via same engine as used for RTMP, RTSP and MPEG-TS. The output protocols are the same plus HLS and MPEG-DASH. It also allows using our Live Transcoder for audio transformation. Read this article to see how you can now setup Icecast transmuxing. Please upgrade or install latest Nimble Streamer and use new Icecast management interface in live pull settings in order to use all new benefits. Live Transcoder also allows manipulating audio channels to split stereo signal into 2 separate streams. Read this article for details. Speaking of Live Transcoder, we've added Linux support for Intel QuickSync. So if you have Intel-powered hardware, you should check this capability. We've added support for RTMP publishing into most popular live CDNs - Akamai and Limelight. They have special requirements for RTMP authentication and we have them covered now. Read more about Limelight RTMP setup and Akamai RTMP setup. We've added a few more codecs into our transmuxing engine. You can see full list of supported codecs here. There are plenty of them there. Also, we've update MP4 support to handle EditListBox (elst) primitive for VOD transmuxing. Our customers we asking for HTTP Referer header support in our paywall feature set. So we've added Referer groups into WMSAuth engine. They can be used in Deny lists. Our SDK for iOS was updated with live rotation capabilities that work the same way as in Android. You can install Larix Broadcaster from AppStore to try it out and get mobile SDK on our website. WMSPanel control API was updated with HTTP origin alias methods. We've also updated the API reference page with new UI for your convenience. It's now easier to find any functionality or method. The last but not the least update: check the State of Streaming Protocols for July 2016. The metrics calculations are based on 3.16 billion views. The stats are collected from 2800+ media servers (Nimble Streamer and Wowza). Protocols share remain stable, i.e. HLS share is about 71% with progressive download still having 9%. You can compare that to June stats below. Nimble Streamer paywall capabilities cover several aspects of content protection. Today we add another enhancement - access control based on HTTP "Referer" header. You may add required Referers as regular expressions into deny list to avoid them accessing the streams. Let's see how this is set up. Our customers use Nimble Streamer for building live streaming networks with their own infrastructure. However there are cases when some external CDN needs to be used to provide additional geo coverage and off-load your network during peak hours or extraordinary events. Thus we added Limelight CDN RTMP publishing support in Nimble Streamer. It's based on RTMP re-publishing scenario with a few additional steps. With Limelight RTMP republishing you can reach broader audience within just a few clicks. Here is the setup instruction. Nimble Streamer has extended audio-related features. This includes processing of AAC as a primary codec. However, a lot of people use other codecs. Nimble Streamer supports AC3 and E-AC3 audio codec for transmuxing. As input, AC3 is supported in RTSP and MPEG-TS incoming streams. As output, AC3 is supported in RTSP, MPEG-TS and HLS outgoing streams. This could easily be supported in MPEG-DASH as well if modern players could handle it in live streaming scenarios. Live Transcoder for Nimble Streamer has rich audio transformation feature set which is based on audio filters and AAC decoding/encoding. 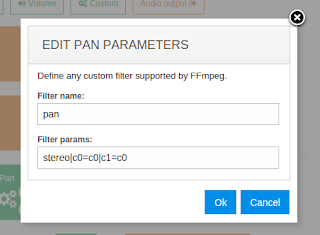 Besides common operations like volume control, changing sample rate or bitrate, you can set up any FFmpeg filters. Let's see an interesting task for channels manipulation which can be accomplished with Nimble Streamer Live Transcoder. There's a stream with video and stereo audio where each of the audio channels has its own language. The goal is to create 2 streams with identical video and different audio, each stream having its language. We assume you've already installed Transcoder. If not, use this procedure. You can check our videos describing general setup process to get familiar with the UI. As a result you need to set up transcoding scenario as shown below. As you can see, first we've made 2 passthrough videos. The next step is to split audio after it's decoded to avoid any resources usage overhead. Then you can see the key element which is "Pan" filter which goes all the magic. It's applied to each of the split audio streams. You can read FFmpeg audio manipulation page for more details about pan filter usage. All you need after that is to add 2 standard AAC audio encoders. 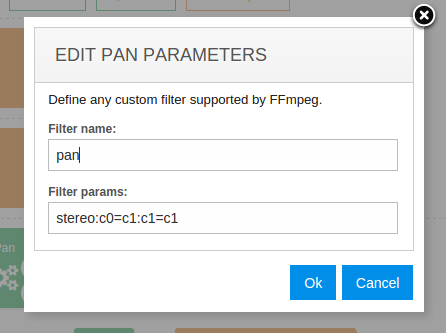 As in previous case, you need to use "pan" filter to create mono stream from stereo. Here one channel will take Front Center + Front Left + Side Left and another one will take Front Center + Front Right + Side Right. This will have one channel take Front Center + Front Left + Back Left and another one will take Front Center + Front Right + Back Right. You can check audio layouts names on this page. That's it. When the scenario is saved, it's applied to the Transcoder instance. The result stream will be delivered via any protocol which you defined for corresponding applications, e.g. RTMP, HLS etc. To set up more audio encoding parameters, please check Audio encoder parameters video on our YouTube channel. Specifically, read more about re-sampling audio. Feel free to visit Live Transcoder webpage for other details and contact us if you have any question. Nimble Streamer media server has a wide VOD feature set which includes transmuxing MP4 files into HLS and MPEG-DASH. MP4 is supported as video+audio, video only, audio only, original MP4 and Apple QuickTime extension. 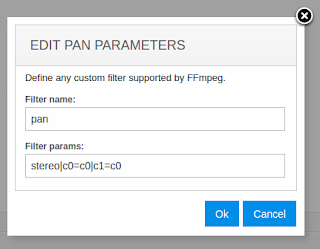 Some MP4 files which were created by FFmpeg tool have its specific edts->elst MP4 atoms used (it's called EditListBox). It's used in case when audio and video are written unsynchronized in order to tell the player or other client software to perform appropriate playback. Nimble Streamer allows using MP4 files with EditListBox atom for further transmuxing into HLS and MPEG-DASH. The resulting media will be fully-synchronized and playable in any player. Contact us if you face any concerns about other MP4-specific issues. Nimble Streamer Transcoder supports Intel® Quick Sync technology for both software video encoding and hardware encoding acceleration using Intel® processors feature set. Nimble Streamer allows using Quick Sync as a H.264 video encoder in transcoding scenarios. Once you have Quick Sync installed, the software encoding is available in our Transcoder by default while hardware acceleration needs to be enabled separately. The instructions below describe how to enable hardware acceleration on Linux. There are currently two SDKs for Linux which support QuickSync technology, their choice depends on your hardware capabilities. Each SDK is released as part of respective Media Server Studio so you need to choose what works best for you and follow its instruction. Once it's set up, you will need to install Live Transcoder itself and then proceed with transcoding scenarios. This SDK is supported in CentOS 7.2-1511. Install 64-bit CentOS-7-x86_64-DVD-1511. When installing, you should use the "Development and Creative Workstation" base environment. Do not update the system via yum update. The installed default components are required. Now go to this link, click "Get the Linux* Community Edition for Free". The new page will require registration or login. Once you log in, please select 2017_R1 or 2017_R2 (this one is preferrable) releases, others are not supported on this OS. Full setup instruction called Getting Started Guide can be found in SDK archive as media_server_studio_getting_started_guide.pdf. Please refer to it for details. This SDK release requires CentOS 7.1 for Quick Sync acceleration to work properly. Current releases of Intel SDK only support Haswell and Broadwell architectures. Follow Transcoder CentOS 7 installation procedure and then follow this article to set up hardware encoder parameters. After that you'll be all set to use Intel hardware acceleration on Linux with our live Transcoder. If you face any questions, feel free to contact us for any questions. Even though Nimble Streamer allows building live streaming networks, there are cases when some external CDN needs to be used to provide additional geo coverage and off-load your network during peaks. This is why we added Akamai CDN RTMP publishing support in Nimble Streamer. It's based on RTMP re-publishing scenario with a few additional steps.